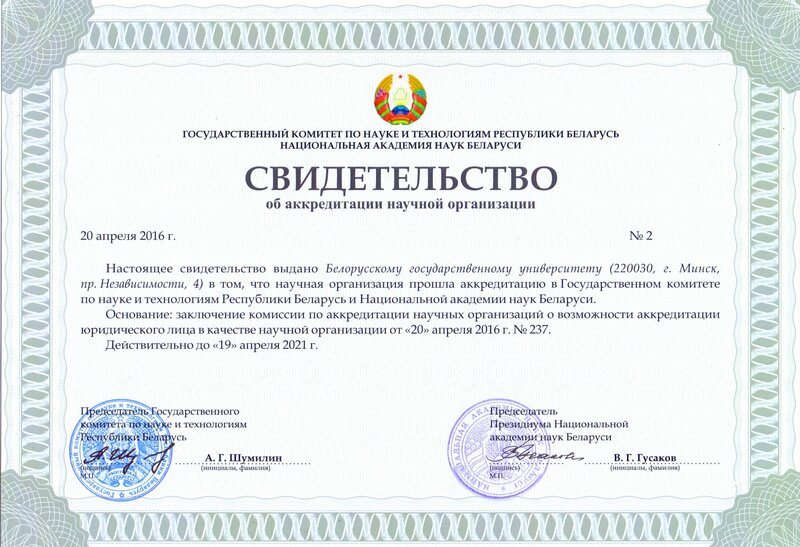 BSU holds a special place in the system of scientific organizations in Belarus (Accreditation certificate for a scientific institution № 2 from April 20, 2016). The results of the research at the University lie at the root of solution of several major problems in science and engineering. University research activities are inextricably linked with the educational process that allows generating new knowledge and training highly qualified specialists with modern methods of solving scientific and technical problems. The University coordination of research activities are carried out by General Directorate of Science (GDS). The unity of the educational, research, and innovation processes enables fast implementation of managerial decisions. 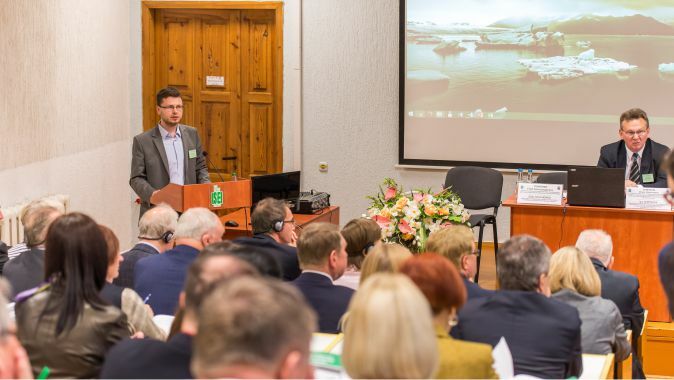 In January 28, 2016, a program of development of the Belarusian State University for 2016-2020 was adopted, This program provides further increase of the effectiveness of science in the university: research funding increased, active work on the conclusion and implementation of contracts with domestic and foreign partners is in progress, a high level of protection of master’s and doctoral theses preserves. Today the BSU includes 4 research institutes, 2 national scientific centers and 5 unitary enterprises. The research carried out by the university staff at faculties and departments is coordinated and directed General Directorate of Science. 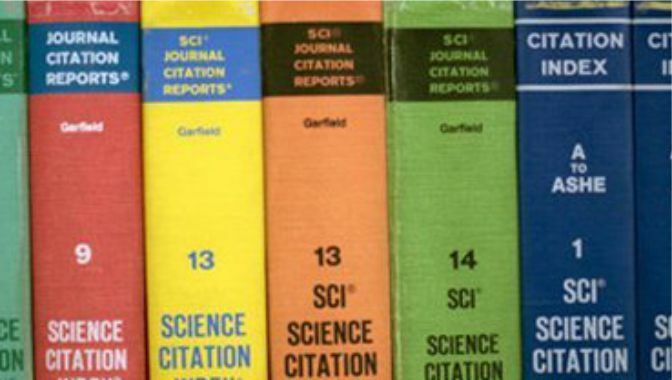 Annually more than 1000 various scientific publications and more than 5000 articles are publishes, more than 100 scientific and practical conferences are held. Belarusian State University is one of the leading universities at the market of development projects. Currently, the university holds 296 assignments (tasks) on 12 state programs of research. BSU is a leading organization and executor in 10 programs. The University is an umbrella organization-executor of SSTP «Standards and scientific instruments”, 2016-2020, (sub-program “Scientific and educational equipment”), and the Research Institute of Physical and Chemical Problems of BSU is an umbrella organization-executor of SSTP “Low-tonnage chemistry”. BSU research institutions created more than 300 products represented in a database of scientific and technical products of the university. Among the most interesting developments of SPC of food supplements of UE “Unitechprom BSU” is complex technological additives to stabilize the quality of flour, phytocompositions for bakery and confectionery products based on phyto-raw materials, compositions of bakeries for people with impaired protein metabolism to prevent cardiovascular diseases, etc. One of the latest developments of SPC of information-measuring systems is digital oscilloscopes BORDO USB, BORDO 211/211A/221, and arbitrary waveform generators AGENT B-230 as a computer board with PCI interface. In agriculture, the most interesting findings are microwave technology of pre-sowing processing of vegetable and forest crops; polyelectrolyte hydrogels “Gisinar” for incrustation of seed crops; veterinary preparations for the treatment of animals microelementhoses. All research institutes and national centers, scientific and innovative enterprises BSU employ about 1,000 scientific researchers and highly skilled specialists. Over recent years, BSU has carried out priority projects on the development of government information resources: the Internet portal of the President of the Republic of Belarus, the information portal of the CIS Executive Committee, information-analytical portal of the Union State, the National Press Center. 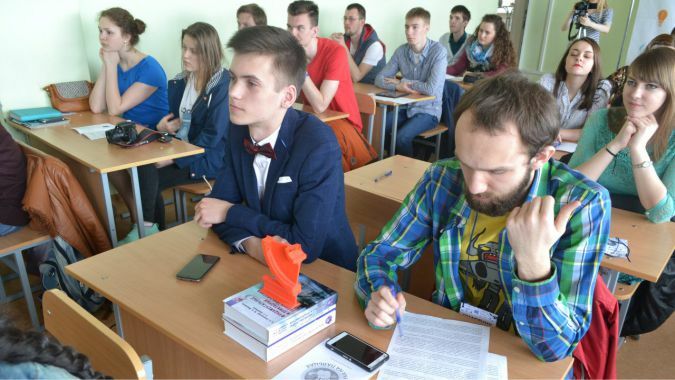 Within the framework of the national program “Informatization of Education System” the researchers developed and put into trial operation the Republican automated monitoring system to ensure institutions of secondary education with training literature. BSU Center for Sociological and Political Studies is a leading sociological center of the Republic of Belarus. It provides a complete set of modern technologies to study the quality of education, problems of students, professional orientation, the study of social and cultural processes of transformation of value consciousness, problems of healthy lifestyle.